And I realised I hadn't posted any interesting things I've found on the web in ages ... until I found two things that I thought were worthy. Firstly, there's the Miss Landmine pageant. 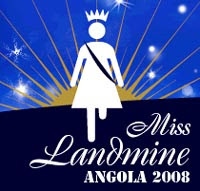 Apparently they're preparing to crown the Angolan Miss Landmine 2008 on 4th April next year. For some reason this touched me. I think it's a marvelous idea and will hopefully help these women who have suffered to feel beautiful as well as gaining some international exposure for the difficulties still being experienced daily after their devastating civil war. I wonder if they're doing somehting similar in Mozambique which is the country I've visited and seen the most damage from land mines. Anyway, I think it's a far better idea than the victims who are standing around on our South African street corners, this is something that will hopefully not only generate personal pride, but national pride for them too. Then I saw something that also made me think of home. In a country where there are so many people living without proper sanitation (or those porta-potty type things that look like they're about to blow over and are miles away from their actual houses / shacks), a mention must go to yesterday having been World Toilet Day. I think that even more interesting than that was an article I saw coupled with that on How Stuff Works about what would happen if everyone in the United States flushed their toilets at exactly the same time - they have a neat little flash animation too :) It's a little scary. Now, before I get into my brewing rant, let me go and get some work done :) I'll definitely try and get it posted a little later today.